language syntax and programming techniques in a clear and concise manner, with numerous examples that illustrate both correct usage and common idioms. 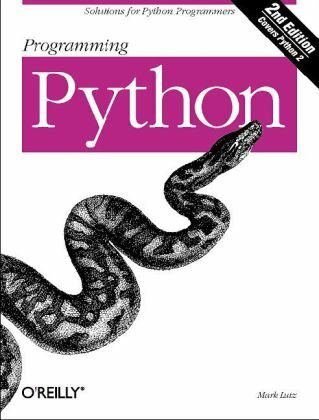 If you're interested in Python programming, you will want this wealth of practical advice, snippets of code, and patterns of program design that can be directly lifted out of the book and applied to everyday programming problems. This 3rd edition is revised and updated for the myriad of changes that came in the 2.4 version. What's Python Not Good For? "Programming Python: The Short Story"
"Erase Your Hard Drive in Five Easy Steps!" "Telling the Monkeys What to Do"
"Splits and Joins and Alien Invasions"
"Widgets and Gadgets and GUIs, Oh My!" "On Today's Menu: Spam, Spam, and Spam"
"Building a Better Mouse Trap"
"Python, Open Source, and Camaros"
"Tune In, Log On, and Drop Out"
"Oh What a Tangled Web We Weave"
What's a Server-Side CGI Script? "Things to Do When Visiting Chicago"
"Surfing on the Shoulders of Giants"
"Give Me an Order of Persistence, but Hold the Pickles"
"Roses Are Red, Violets Are Blue; Lists Are Mutable, and So Is Set Foo"
"See Jack Hack. Hack, Jack, Hack"
"I Am Lost at C"
"Add Python. Mix Well. Repeat." "That's the End of the Book, Now Here's the Meaning of Life"
"Something's Wrong with the Way We Program Computers"
So What's "Python: The Sequel"?